Published on January 10, 2012 in League of Arab States and Middle East by unwatch. 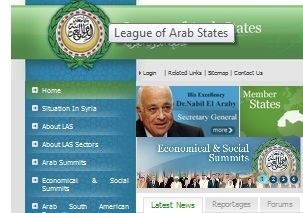 Closed Tags: League of Arab States. The Arab League’s human rights monitoring mission in Syria is seen as a sick joke by the victims on the ground. Protesters across Syria, reports Al Jazeera, are calling for it to end. You may ask: What does the Arab League know about democracy, and about making independent, critical evaluations ? The absence of any United Nations condemnation of the ceaseless Gaza-sourced rocket attacks on southern Israeli cities is highlighted in a letter Israel has sent to UN Secretary General Ban Ki-moon and the UN Security Council. “This is a dangerous trend,” Ambassador Haim Waxman, Israel’s deputy permanent representative to the UN, says in comments reflecting the letter’s content. UNESCO vote to admit Palestine: Who objected? Following is the full count of yesterday’s vote at UNESCO to admit Palestine as a member. No: Australia, Canada, Czech Republic, Germany, Israel, Lithuania, the Netherlands, Palau, Panama, Samoa, Solomon Islands, Sweden, United States of America, Vanuatu. Abstentions: Albania, Andorra, Bahamas, Barbados, Bosnia and Herzegovina, Bulgaria, Burundi, Cameroon, Cape Verde, Colombia, Cook Islands, Côte d’Ivoire, Croatia, Denmark, Estonia, Fiji, Georgia, Haiti, Hungary, Italy, Jamaica, Japan, Kiribati, Latvia, Liberia, Mexico, Monaco, Montenegro, Nauru, New Zealand, Papua New Guinea, Poland, Portugal, Republic of Korea, Republic of Moldova, Romania, Rwanda, Saint Kitts and Nevis, San Marino, Singapore, Slovakia, Switzerland, Thailand, Macedonia, Togo, Tonga, Trinidad and Tobago, Tuvalu, Uganda, Ukraine, United Kingdom, Zambia. Yes: Afghanistan, Algeria, Angola, Argentina, Armenia, Austria, Azerbaijan, Bahrain, Bangladesh, Belarus, Belgium, Belize, Benin, Bhutan, Bolivia, Botswana, Brazil, Brunei Darussalam, Burkina Faso, Cambodia, Chad, Chile, China, Congo, Costa Rica, Cuba, Cyprus, Democratic People’s Republic of Korea, Democratic Republic of Congo, Djibouti, Dominican Republic, Ecuador, Egypt, El Salvador, Equatorial Guinea, Finland, France, Gabon, Gambia, Ghana, Greece, Grenada, Guatemala, Guinea, Honduras, Iceland, India, Indonesia, Iran, Iraq, Ireland, Jordan, Kazakhstan, Kenya, Kuwait, Kyrgyzstan, Lao People’s Democratic Republic, Lebanon, Lesotho, Libya, Luxembourg, Malawi, Malaysia, Mali, Malta, Mauritania, Mauritius, Morocco, Mozambique, Myanmar, Namibia, Nepal, Nicaragua, Niger, Nigeria, Norway, Oman, Pakistan, Paraguay, Peru, Philippines, Qatar, Russian Federation, Saint Lucia, Saint Vincent and the Grenadines, Saudi Arabia, Senegal, Serbia, Seychelles, Slovenia, Somalia, South Africa, Spain, Sri Lanka, Sudan, Suriname, Syrian Arab Republic, Tunisia, Turkey, United Arab Emirates, United Republic of Tanzania, Uruguay, Uzbekistan, Venezuela, Viet Nam, Yemen, Zimbabwe. Absent: Antigua and Barbuda, Central African Republic, Comoros, Dominica, Eritrea, Ethiopia, Guinea-Bissau, Guyana, Madagascar, Maldives, Marshall Islands, Confederated States of Micronesia, Mongolia, Niue, Sao Tome and Principe, Sierra Leone, South Sudan, Swaziland, Tajikistan, Timor-Leste, Turkmenistan. A week-long assault from armed groups based in Gaza, part of the territory claimed by President Mahmoud Abbas to be under his jurisdiction, has injured 20 Israelis, and killed Moshe Ami, 56, who was mortally injured by flying shrapnel from a rocket fired Saturday at a residential neighborhood in the southern city of Ashkelon. “The long-sought peace that the Palestinian and Israeli peoples so rightly deserve cannot be achieved by unilateral actions at the UN, but only by face-to-face talks,” said Neuer. Out of 173 countries voting, 107 voted in favor of the Palestinian request, sufficing under UNECO rules but falling short of the two-thirds support that many expected. There were 14 opposed, including the US, Germany and Canada, and 52 abstentions, including the UK. Statement delivered by Hillel Neuer, executive director of UN Watch, to the UN Human Rights Council in its debate under Agenda Item 4, “Human Rights Situations That Require the Council’s Attention,” 16 June 2011. If human rights standards are applied selectively, in what sense can they be considered standards? The credibility of the United Nations turns on this question. Let us consider and compare two events. One year ago, this council was holding a three-week session, just like this one. Suddenly, the Arab and Islamic states demanded an interruption, to debate the deaths of nine members of a so-called humanitarian flotilla. As it happens, many of the passengers had been recruited by the Jihadi IHH organization, and had boasted of their seeking to die as martyrs. After he successfully blocked a war-crimes probe into the conflict in Sri Lanka, why is the country’s ambassador to the U.N. in Geneva, being recalled? Ambassador Dayan Jayatilleka himself offers two different explanations. Last month, at the U.N. Conference on the Question of Palestine in Geneva, he blamed Israel. “I’m leaving because of protests Israel made about my speeches [condemning Israel’s military operations in Gaza],” he told the gathering on July 23. In the same statement, Jayatilleka also urged Palestinians to reconsider focusing their “resistance” operations at “soft targets” — not for reasons of morality or international law, but because to do otherwise “plays into the hands of the international media,” he said. “One photo of a rocket and a Jewish kid hiding in a cellar and you get the whole Holocaust narrative all over again,” he complained. So who’s responsible for Ambassador Jayatilleka’s departure, the Sri Lankans or the Israelis? Did the diplomat known for provocative speeches sacrifice his posting on the scenic shores of Lake Geneva for the noble cause of Palestine, or power-sharing with the Tamil minority? Depends, it seems, on whom one is talking to. The home page of the U.N.’s news center displays focus sections on a handful of regions, one of which is the Middle East. There one might expect to find special features on the brutal beatings, arrests, and show trials now occurring in Iran, reports about women subjugated in Saudi Arabia, and statements about bloggers and other dissidents arrested and jailed in Egypt and Syria. Yesterday at the U.N., a panel discussion on “Islamophobia” turned heated when its focus shifted to anti-Zionist conspiracy theories. This side event to the Durban Review Conference was organized by the Islamic Human Rights Commission, a key agitator of the 2001 Durban NGO forum, known for its anti-Semitism that was denounced by High Commissioner Navi Pillay as a betrayal of the anti-racism cause. The U.N. Human Rights Council concluded its main annual session on Friday, March 28. Before the start of the session, Freedom House published an updated report on Freedom in the World, which listed eight countries and two territories that suffer from the “worst of the worst” human rights violations: North Korea, Turkmenistan, Uzbekistan, Libya, Sudan, Burma (Myanmar), Equatorial Guinea, Somalia, Tibet, and Chechnya. The human rights records of another eleven countries and territories ranked just slightly above. Amongst the more than two dozen resolutions adopted by the council this session, only those on Myanmar and North Korea condemned “worst of the worst” violators. The situation in Somalia was addressed, but in a weak manner with government actions enjoying more praise than criticism. There was also a weak resolution on the Congo, a country in the midst of a large-scale humanitarian crisis. By contrast, Israel —ranked as “free”— was strongly condemned in five one-sided resolutions. At the U.N. Human Rights Council today, states debated Israel’s rights violations in the “Occupied Palestinian Territories” (OPT) and surrounding areas. The discussion began with the presentation of a report by Richard Falk, the U.N.’s Special Rapporteur on the OPT. • Canada condemned Hamas’ rocket attacks against Israel, saying that they are “the cause of the conflict,” that there have been “hundreds and hundreds of rocket attacks, which deliberately target civilians,” and that “first and foremost these rocket attacks must stop.” Canada expressed its concern about the failure of the resolution to clearly establish responsibility of both sides in the conflict, as well as its use of inflammatory language. • The EU (Czech Republic) expressed its hope that consensus will be reached, and proposed the necessary amendments to win the resolution its approval. The EU stated that its aim is to create a more balanced text that addresses the responsibilities of both sides, includes a call for an immediate cease-fire, acknowledges the peace process and the suffering on both sides, includes the rocket attacks against Israel in the text, and addresses humanitarian issues and measures to alleviate suffering. • Switzerland said that this is “a different situation than the one in the past couple of years” and expressed its strong desire to reach a consensus on the resolution, albeit with amendments. • Egypt condemned Israel’s “deliberate attack” on the UNRWA school, which amounted to the “targeted assassination” of more than 40 Palestinians, including many children. It proposed amendments to further bash Israel, including for the purported destruction of Palestinian cultural sites and the disallowing of journalists to enter Gaza. • A number of states wanted the language of the resolution to be even more inflammatory and one-sided. Algeria requested an additional paragraph to “express outrage at the killings of women and children carried out in full impunity” and that the word “massive” should be added to “grave violations” of human rights by Israel. South Africa wanted the word “systemic” added to this clause too. • South Africa condemned Israel for failing to cooperate with the Special Rapporteur on the Occupied Palestinian Territories, Richard Falk (who has compared Israelis to Nazis and has a one-sided mandate to only investigate the abuses committed by Israel). South Africa called for a new, UN fact-finding mission of the special rapporteur with the support of the five UN experts on human rights law to report to the March session of the Human Rights Council. Switzerland supported the proposal for a fact-finding mission, saying that it should particularly focus on the attack on the UNRWA school. Pakistan and Monaco supported this Swiss proposal. • Cuba condemned Israel’s “large-scale aggression,” as well as the military assistance Israel receives from “international powers.” It said that it found some of the proposals from the EU and Canada to be unacceptable. • The inclusion of rocket attacks against Israel in the resolution was debated. Although Russia said that the rocket attacks were a “pretext” for the conflict, it also noted that Libya had circulated a document which makes reference to them so it did not see why they could not be included in the resolution, especially as it will help bring about consensus. Egypt and various other countries argued that it is acceptable to include the rocket attacks so long as it is mentioned that more Palestinians have been killed by Israel than Israelis killed by rocket attacks, and that Israel’s actions are “disproportionate.” Cuba stated that if rocket attacks against Israel are to be included, so should the “indiscriminate” use of mortar fire and cluster bombs by Israel. The characterization of Israel’s actions as “disproportionate” was repeated by Bangladesh, Pakistan, Malaysia, Lebanon, Cuba, and a little more surprisingly by Mexico and Brazil. • Bangladesh stated that “the actions of a few Palestinians cannot be equated with the views of a government,” and condemned the “collective punishment” and “targeting of civilians” by Israel. It criticized the notion that the rocket attacks were the cause of the conflict, arguing that “unless the occupation ends, this situation will continue to happen and we will continue to have special sessions one after another” (thus tacitly justifying Hamas terrorism and ignoring the fact that Israel withdrew from the Gaza Strip in 2005). • The office of the UN High Commissioner for Refugees spoke about the need for there to be access to asylum for Palestinian refugees from Gaza. Diplomatic scandal: Were ambassadors’ signatures forged for UN rights session on Gaza? Who really requested tomorrow’s U.N. Human Rights Council emergency session on Gaza? Why were certain country names listed and then removed? So the truth can come out, the U.N. secretariat should make public the original signature forms, as it has always done in the past. According to a January 6th letter signed by the Ambassadors of Egypt, Pakistan and Cuba, on behalf of the Arab, Islamic and Non-Aligned blocs, as posted on the UN website, 29 HRC member states signed the initial request, including Bosnia-Herzegovina and Cameroon. A subsequent note verbale issued the same day by the UN secretariat (OHCHR) added Russia, bringing the number to 30. Suddenly, however, in a corrected note verbale, dated January 7, the secretariat lowered the number to 29, mysteriously removing purported signatory Bosnia. The same number was reflected in a UN press release issued that day. Then, in an email sent today at 11:00 a.m. to all member states, signed by Eric Tistounet, chief of the OHCHR Human Rights Council Branch, Argentina, Brazil and China were added, and the number raised to 31 signatories. But wait: doesn’t 29 + 3 = 32? Normally, yes. But, mysteriously again, the name of another supposed signatory was removed: Cameroon. Were Bosnia-Herzegovina and Cameroon listed without their knowledge or consent on the original letter sent by the ambassadors of Egypt, Pakistan and Cuba? If so, this diplomatic scandal underscores how the U.N. often works. Powerful bloc “coordinators” make all the decisions, often without even bothering to consult the less influential members of their own group, in whose name they claim to speak. Normally, the U.N. secretariat releases the actual request forms, showing each ambassador’s signatures. This time, however, the only signature released by the U.N. was that of Russia, which followed after the initial group request. Is it possible that the two signatures were forged? How many others as well? Or were there never any signatures to begin with, and did the secretariat act hastily, listing Bosnia and Cameroon based only on the letter by Egypt, Cuba, and Pakistan? The U.N. should immediately release the original request forms. As expected, the U.N.’s human rights officials are rushing to slam Israel for defending itself against Hamas rocket attacks (see new release below). 1. The word Hamas appears nowhere in their statement, and its sole responsibility for the crisis — as acknowledged by the Arab leaders of Egypt, Saudi Arabia, and the Palestinian Authority — is nowhere mentioned by the UN experts. Nor is there any mention of the double war crime of Hamas’ targeting of Israeli civilians and then hiding among Palestinian civilians. 2. The majority of the experts who purportedly signed this statement have entirely unrelated mandates — on countries like Somalia, Haiti, Burundi, Cambodia, North Korea, or on issues like toxic waste and transnational corporatoins — and have no legal authority to speak on issues irrelevant to the defined mandates given them by the Human Rights Council. What one expert cannot address on his or her own does not become justiciable simply by joining others. But basic procedures at the Arab-controlled U.N. human rights council and its related entities always seem to fall by the wayside when the target is Israel. “The Coordination Committee of Special Procedures is deeply alarmed at the continuing violence in Gaza. We stress that international human rights law continues to apply and that it imposes binding obligations on all parties in situations of armed conflict. We call on all parties to immediately cease all actions that result in civilian casualties, or put them at great risk. Both air strikes by Israeli Government forces and rocket attacks from Gaza into Israel are resulting in inexcusable loss of life and placing the civilian populations in the affected areas in extreme danger. The use of disproportionate force by Israel and the lack of regard for the life of civilians on both sides cannot be justified by the actions of the other party. They constitute clear violations of international human rights and international humanitarian law. We are particularly concerned at the impact of the current violence and destruction of vital infrastructure on the already dire humanitarian situation in Gaza. We call on all parties to immediately ensure full access to humanitarian actors and supplies and enable them to carry out their work of distributing food, treating the sick and injured, and guaranteeing the provision of essential energy and sanitation. AUSTRALIA has switched its position to vote against Israel on two resolutions at the United Nations, ending the Howard government’s alignment with the United States. In the weekend vote in New York, Australia supported a resolution calling on Israel to stop establishing settlements in the Palestinian territories and a resolution calling for the Geneva Conventions to apply in the Palestinian territories. Geneva, Aug. 25, 2008 — The UN Human Right Council’s expert on Palestine today praised a boat trip to Gaza by pro-Palestinian campaigners (see UN statement below), without revealing his own affiliation to the group. “Regrettably, this is the kind of questionable conduct that we have come to expect from Richard Falk, a UN official who repeatedly expresses support for the conspiracy theory that the U.S. was behind the terrorist attacks of 9/11,” said Hillel Neuer, executive director of UN Watch, an independent Geneva-based monitoring group. A June 26 report by the Palestine News Network reported that Falk was initially planning to be a participant on the boat to Gaza, revealing his close ties to the protesters and their campaign. Falk’s statement today called Israel “Tel Aviv,” a designation commonly used by countries that do not recognize the Jewish state. 33 of the Fourth Geneva Convention. peace boats brought 200 hearing aids to Gaza added Falk. and for the standards of international human rights. The first outline for the declaration to emerge from the 2009 Durban Review Conference breaches the red lines set forth by France, the UK, Netherlands and other EU governments, with special references to the Palestinians as victims of Israeli racism. On May 27 in Geneva, the UN working group tasked with preparing the outcome document of the April 2009 conference circulated a “non-paper” — setting forth the “inventory of issues” to serve as the skeleton of the final declaration — that singles out Israel twice, raising the specter that the Jewish state will, like in 2001, stand specially accused of racism. First, under the header “Victims of racism, racial discrimination, xenophobia and related intolerance,” the draft document’s list of “Victims Identified by the Study of Experts under the Inter-Governmental Working Group” makes a special reference to the Palestinians, with Israel by implication cast as a racist perpetrator. People under foreign occupation: The protection of the civilian population under foreign occupation has been on the agenda of the international community for a long time. The history of armed conflicts shows that the particular vulnerability of this group is dramatically enhanced if it is connected to racial or ethnic distinction from the occupying power. The Durban Declaration expresses concern about the plight of the Palestinian people under foreign occupation. Second, under “contemporary forms of racism as reported by different countries,” Israel is again singled out, in the document’s summary of Iran’s national report. To be sure, Iran’s 7-page report to the conference does single out Israel. So should the UN be faulted for accurately summarizing one country’s report? The answer is that not everything submitted by every country is required to be included in the universal outcome document. Indeed, it is rather curious that when Iran’s seven pages on numerous topics are reduced to merely one paragraph, the UN document makes certain to include the reference to the Palestinians. There is an increase in racist violence and xenophobia in many parts of the world as well as of defamation of religion, the rejection of diversity and Islamophobia or incitement against Islam. Comment is made on the situation in the Occupied Palestinian Territories, which constitutes a violation of a wide range of civil and political rights. European states have insisted they will not tolerate any repeat of the anti-Semitism of the 2001 Durban conference, which sought to delegitmize the Jewish state by singling it out with the racist label. With the draft outcome document (in its formative stage as an “inventory of issues” non-paper) now threatening to turn the conference — as Sarkozy rightly put it — “into a forum against Israel,” will the EU now defend their red lines, maintaining the threat to walk out if these are not respected? The UN opened its “International Meeting on the Question of Palestine” in Malta yesterday. Led by Paul Badji of Senegal, Chairman of the Committee on the Exercise of the Inalienable Rights of the Palestinian People, the conference identified the main obstacles to peace, particularly “the continued construction of Israeli settlements and the separation barrier, restrictions on movement in the occupied West Bank, violence and humanitarian suffering in Gaza, the plight of refugees, [and] the status of Jerusalem.” There were no references to Palestinian suicide terrorists or Qassam rockets fired daily by Palestinians against Israeli civlians in Sderot and Ashkelon. Those participating in the ritual Israel-bashing included Cuba on behalf of the Non-Aligned Movement, Malaysia, Tunisia, Madagascar, and the Organization of the Islamic Conference (OIC). Interestingly, some participants referred to the challenge to the peace process posed by “differences among Palestinians” — a gentle euphemism for Hamas’ violent takeover of Gaza. An independent High Level Fact-Finding Mission by Archbishop Desmond Tutu and Professor Christine Chinkin, of the Centre for the Study of Human Rights at the London School of Economics, will visit Beit Hanoun during their mission to the occupied Palestinian territory of Gaza on 27 and 28 May. The High Level Fact-Finding Mission to Beit Hanoun was established by the United Nations Human Rights Council in November 2006 after an Israeli attack resulted in the deaths of 19 people, including seven children. Archbishop Tutu and Professor Chinkin will enter Gaza from Egypt and, in addition to visiting Beit Hanoun itself, are scheduled to hold a range of meetings in Gaza, including with survivors and witnesses of the attack on 8 November 2006. The mission will submit a final report to the September session of the Human Rights Council. The terms of this 2006 mandate presume Israel’s guilt and omit little details such as the Hamas rocket attacks from the areas to which Israel returned fire. Those were just some of the reasons why Professor Irwin Cotler, former Justice Minister of Canada, turned down a request to join the mission, as he exlained in the Boston Globe here. Since 2006, many things have happened — including in Beit Hanoun, which was already the subject of a mission by no less than High Commissioner Louise Arbour, shortly after the incident. For one thing, in June 2007 Palestinians were shooting at patients in the Beit Hanoun hospital. Will the the Tutu mission, whose terms are dictated by the Islamic-dominated Human Rights Council, consider those victims — about whom no UN commissioner has ever reported? Don’t bet on it. Another thing. This would seem to be the first time that UN officials are entering Gaza via Egypt. But if the UN now formally acknowledges the geographic reality that Gaza also has a border with Egypt, can they sustain their curious position that Israel, after having evacuated every last Israeli soldier and civilian from the territory, still “occupies” it? To the sound of cheers, and by an overhwelming majority of 40 out of 47 votes, the UN Human Rights Council today elected Jean Ziegler, the co-founder of the “Muammar Khaddafi Human Rights Prize,” as an expert advisor representing the Western world. And for its new Palestine expert, the council chose Richard Falk, who, like Ziegler, accuses the U.S. of being responsible for many of the world’s ills and describes Israel in Nazi terminology. Falk was approved by consensus. Canada afterward made a statement dissociating itself from the choice. The U.S., a non–voting observer, also took the floor to criticize Falk’s published writings. Ziegler, criticized by many for his performance as former UN expert on the right to food, earned more votes than any of the other candidates. Immediately after the vote, Swiss ambassador Blaise Godet left his seat, and, in front of all the diplomats in the plenary, walked over to warmly shake hands with the Cuban ambassador, both smiling as they congratulated each other. The Castro regime chairs the all-powerful Non-Aligned Movement. The text is similar to previous one-sided resolutions, such as A/HRC/2/3, adopted on November 27, 2006. It ignores Syrian rejectionism and sponsorship of terrorism. It treats the events of 1967 without mentioning Syria’s systematic shelling of Israeli communities from positions on Golan Heights, its leader’s calls for a “war of annihilation” against Israel, and Syria’s 1967 aggression that led to its loss of the territory. It neglects to mention Israel’s repeated offers to trade 99 percent of the Golan for peace, Syria’s sponsorship of the enemies of the peace process, and its support for terrorism. It is redundant to 2 resolutions already adopted this year by the General Assembly, A/Res/62/110 and 62/85. This only demonstrates the utter irrationality and absurdity of devoting precious UN time and resources to meaningless anti-Israel exercises. It makes no mention of massive Syrian human rights violations. That the HRC should pass a resolution concerning Syria without mentioning Syria’s own abysmal record is absurd. During the meeting, the Syrian chairman said he hoped to see the resolution adopted by consensus. Algeria, Morocco, Palestine on behalf of the Arab Group, and Pakistan on behalf of the Organization of the Islamic Conference welcomed the resolution, criticizing Israel for “unacceptable practices” and human rights violations. Western states at the consultation — Canada, Portugal, Switzerland, Denmark, UK among others — were silent. The UN Human Rights Council today adopted its 16th one-sided censure of Israel since the supposedly reformed body was founded in June 2006. Apart from passing mention of Burma, the Islamic-dominated council of 47 governments has criticized no other country. The Arab-sponsored censure came under the council’s only agenda item dedicated to a specific country. In order to rap Israel quickly, the entire timetable of the March session was rearranged, wreaking havoc on the ability of UN experts and NGO activists to participate when their areas of focus will now be debated. Syria said that “children and babies were being gunned down in pure barbarity” by Israeli authorities. Malaysia called Israeli occupation the “worst form of colonialism and apartheid,” while Sudan said that there is a “holocaust being perpetrated in Gaza by Israel.” The term “holocaust” to describe recent events in Gaza was used repeatedly during the debate. The final resolution was adopted by 33 votes in favor, with Canada casting the sole opposing vote, and 13 abstentions. Switzerland was the sole European country to endorse the resolution, which was introduced by the Arab and Islamic blocs. Switzerland also actively lobbied other countries to support the condmenation of Israel by suggesting minor changes.